James started his career working four years for transportation and energy focused investment bank Dahlman Rose in New York. 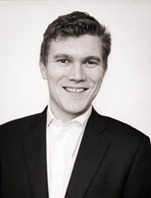 In 2011 he moved back to Oslo and set up NorthCape. The company was established as a partnership between the employees and shipping professionals. NorthCape operates from offices worldwide with main offices in Oslo and Singapore. James is Managing Partner of NorthCape Pte Ltd here in Singapore. NorthCape has since establishment originated, structured and closed over 35 lease and financing transactions for 90+ assets with transaction value in excess of USD 10 billion and funding in excess of USD 8 billion.